Yes, last week was outrageously cold. And amazingly, it’s gone from 0 to 60 in four days, oddly similar to your humble correspondent’s first pick-up truck. But that POLAR vortex was SO January, and now we’ve moved on. TODAY we must continue to grapple with a much greater threat to our daily existence, the disappearing KOHLER vortex. I’m referring to that swirling whirlpool of water you see in the toilet bowl after you flush, which over the years has become weaker and weaker. The result of this has been… well, you know. Like allegedly so many of our problems, the Kohler Vortex problem is NOT a natural occurrence, but is man-made. More specifically, CONGRESS-man-made. Not satisfied that only 71% of the Earth’s surface is composed of the non-exhaustible resource, water, zealous federal regulators have driven toilet tank capacities way, way down – over the years, from as much as never-need-a-plunger levels of 8 gallons per flush to as little as forever-calling-Fix-St-Louis levels of 8/10 of a gallon per flush. To be fair, you can’t really blame Congressional leaders like Mitch McConnell or Nancy Pelosi for not seeing this problem from their distant thrones, given that they don’t actually FLUSH, much less PLUNGE, their own toilets. Those functions are handled by unpaid interns. Yes, it’s true that toilets don’t flush as well as they once did, and an unsightly toilet plunger has become almost mandatory next to every toilet (Martha Stewart, are you listening?). But there’s no question that today’s toilets work a whole lot better than when these federal regulations were first introduced, and they should continue to improve as, hopefully, more college students realize that opportunities in toilet engineering now exceed those in the liberal arts. In the meantime, you should not be scrimping by buying the cheapest toilet. As a rule, you should be selecting from among the best ones you can find that do not have fancy, designey-type styling or bells & whistles you believe to be silly or unnecessary. And speaking of bells & whistles, are you aware that some of the toilets sold have TWO buttons for flushing, one with diminished water flow for #1 and the other at the government-mandated maximum flow for #2? Yeah, at first I thought it was a joke, too, but I’ve actually seen them in person! I don’t get the sense that these have really caught on – after all, it doesn’t make your toilet flush any better. I say, don’t buy one, you’re only encouraging the federal bureaucracy. Who knows? When the regulators dig deeper, just imagine how many classifications of human waste they’ll find? These dual flush toilets might go from 2 buttons to a full keyboard! Q. How can you tell if a homeowner owns a Toto toilet? A. Don’t worry, they’ll tell you. These toilets are made by a Japanese company, and they have a reputation for clogging less often. They have been said to have less convoluted piping below, and larger flush valves in the tank. However, Toto competes against at least two VERY strong and innovative companies, Kohler and American Standard. Sooner or later, if not now, I suspect whatever performance difference there is or was will disappear. We are already seeing signs that Toto is becoming just another high quality brand, not that there’s anything wrong with that. You once had to pay up to $1,000, and in many cases MANY thousands, for a Toto toilet, but Home Depot now sells some units with the Toto brand at standard toilet prices. So shop carefully, and beware of the hype. Looking into my “crystal bowl,” I’m going to predict that someday there will be an electrical outlet behind every toilet. That home inspectors will even write you up if you DON’T have one. These outlets will almost certainly be used for pumps to improve flushing performance in light of the onerous federal water capacity limits, but they will also be used for functions unimaginable, some of which you can see today at the Kohler showroom on Clayton Road west of downtown Ladue. Motion-sensing toilet seats that open when you approach, man-resistant seats that lower automatically when done, foot warmers, music, remote control by Blue Tooth, colored lighting, seat warmers, massagers, checking by smart phone to see if it is “occupied,” bidet-type features, and more. You have no idea. As we approach the promise of adding electrical power to toilets, surely federal regulators must now be plotting to curb the energy use from those additional electric outlets. Must be frustrating to think they may never get us back to that waterless, powerless outhouse with the cut-out crescent moon. While sitting in a Lion’s Choice the other day, daydreaming about leaky faucets, the background music suddenly caught my attention. I couldn’t quite make out the lyrics, but they went something like “if you like it, you better put a wax ring on it”. For a moment, I thought the singer — someone you probably never heard of named “Beyonce” — was speaking only to me, and her words brought back a flush of memories of all the times Fix St Louis had spared our customers further ceiling and furniture damage by changing the wax ring on an upstairs toilet. So I went online looking for the video, where I watched her dance with 2 OTHER young ladies singing about their eligibility, and ALL of them had tremendous talent. And by “talent” I mean that if this dancing thing doesn’t work out for them, we sure could use their ability to contort their bodies to climb under kitchen sink cabinets to fix drains, slither through crawl spaces, and scamper through attics while stepping only on joists to avoid plunging through the ceiling immediately below. Apparently, the baby in the video below also finds their dexterity remarkable and worth emulating. Now, not being familiar with Beyonce’s full body of work, I don’t know if her songs cover the full range of causes of ceiling water leaks. So just in case, here are the most likely causes for these leaks that we see at Fix St Louis. Toilet Wax Rings: As it turns out, the most common cause of leaks from ceilings is, unfortunately, also the most disgusting. So rather than spend any time thinking about what is causing that stain, just call us, and we will take care of that pesky connection between your toilet and the drain pipe beneath it. Shower & Bath Drains: It’s not uncommon for drain pipe connections beneath showers and tubs to wear out or become misaligned. Sometimes we can fix this from above, but often we need to cut out the ceiling below to pinpoint the problem and replace the plumbing parts. Incidentally, this is the single best reason to hold onto old ceiling paint you’ve used, because after we’ve patched that hole that we needed to cut for access, or primed the stained area, matching new paint to the surrounding ceiling is often nearly impossible, and requires painting the entire contiguous ceiling. Caulking & Grout: You might think that water is stupid, but actually it’s very smart. It has an uncanny ability to find even the smallest hole to fit through, and the most meandering pathway, in its quest to join you and your family in the room below. So look for holes, cracks, and gaps in that white goop along the ledges & seams of your tub or shower — inside & out. And, don’t forget the base of your toilet. Fix St Louis can plug these up. These are generally not the types of repairs homeowners can take on themselves. And if you ever had someone in your home try to do caulking, there’s a good chance there’s now a thick, ugly glob of white goop where a narrow white line used to be. So, next time you see a water stain on your ceiling, take Beyonce’s advice — “Say our name, say our name.” When it comes to repairing leaks and restoring drywall, Fix St Louis has all the moves you need. Who’s gonna ‘Make American Toilets Great Again’ so WE don’t have to? Once upon a time, after Americans pressed the lever on a toilet, they immediately walked away. They didn’t stare inside the bowl to make sure everything went down. They didn’t listen in from the next room for a minute or two until the water stopped running. They didn’t buy a plunger for every toilet, then display this lovely item near their designer faucet and oil-rubbed bronze accessories. But then, the Russians hacked our toilets. Or maybe a snake told Eve to take a bite out of an apple. But whatever it was, there’s gotta be a better explanation than Congress suddenly deciding our ‘business’ was their business, and decreeing that toilet tank capacities must be reduced by more than 75% to a puny 1.6 gallons today. Because you know, our world, whose surface has always been 70% water, is running out of water. Or something. Now, not to brag or make anyone jealous, but we at Fix St Louis are the Zen Masters of toilet repair. We spend a lot of time with our heads in toilets, and can always get them working again. Yes, we realize that given the amount of revenues we generate from fixing toilets, some of you might suspect Big Handyman lobbied Congress to make things this way. But no, we’re actually concerned it may be a national security risk for Americans to spend so much time with their pants down thinking about toilets, and believe these should be the FIRST regulations to be rolled back. Don’t worry about us. If the government liberated our toilets so they worked again, we at Fix St Louis could keep ourselves plenty busy with your needs for other repairs on plumbing, electrical, drywall, carpentry, decks, fences, windows, doors, floors, and pretty much everything else. But until then, welcome to McToilet – may we take your order? Welcome to McToilet: May We Take Your Order? If America can send a man to the moon, why can’t we make a reliable toilet? You know what I’m talking about—every once in awhile you have to jiggle the handle to make it stop running. Sometimes it doesn’t stop running at all, or it runs for a few minutes, then stops running, then runs again, then stops – all night long. The good news is that until mankind conquers this final frontier, there will always be Fix St Louis. We spend a lot of our time with our heads in toilets, and know more about them and how to fix them than you would ever want to know. 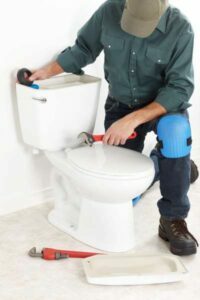 What Do We Know About St. Louis Toilet Repair? – Within the tank, we know our filler valves from our flush valves, and our floats from our flappers. – We can deal with that drip-drip-drip from the bottom of your tank, or from that strange faucet handle sticking out of your wall. – We can deal with that ominous fluid crawling out from the base of your toilet, and those cracked or rusted Frankenstein-head-like bolts down there. – We can stop your toilet from acting like a rocking chair. – We can even help save your marriage by installing one of those new, no-slam toilet seats! At Fix St Louis, YOUR business is OUR business. Fill out our form or call us for a free estimate on a repair, and fall in love with your toilet all over again! Mr. Gorbachev, Tear Down Those (shower) Walls! Sorry, but I have always had this fantasy of hiring a technician named Gorbachev, so I could hear our customers use that line. But, I can’t seem to lure the real one out of retirement and into a Fix St Louis shirt. Go figure. Anyway, today we’ll be discussing those yucky walls around your shower or tub. If that sentence made no sense to you, you’re free to go. But for the 99% of you remaining, you know what I mean. Those walls with those sickly, shiny avocado green squares that are supposed to have dry white stuff between them, but the white stuff is missing in places, or the white stuff is actually now black. Maybe a tile or two are sticking-out, missing, or a bulge of wet drywall behind it is shoving tiles out of place.